Snowbee Wooden Frame Hand Trout Net With Rubber-Mesh. This new range of hand Trout nets is made from laminated Red Meranti wood for strength and light weight. Available in two frame sizes to cover all requirements, from small wild Brown trout in moorland streams up to larger stocked brownies and grayling in the larger rivers. 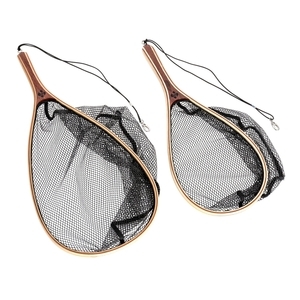 Both models are fitted with a fine 6mm rubber-coated mesh to avoid scale damage for catch and release, and also avoids unpleasant odour and hooks catching in the mesh. Fitted with a handle eye to which an elasticated lanyard and clip are attached. Perfect size for river fishing light weight and silicon net to avoid injury to fish. Before the large mesh soft rubber netting was introduced for nets this net would have been seen as an ideal net for fish retrieval. In my opinion it is no longer suitable for landing fish. The new netting is far superior for fish health.